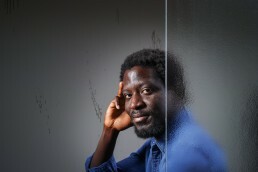 Ibrahim Mahama b.1987 in Tamale Ghana is an artist who lives and works in Accra, Kumasi and Tamale, Ghana. He started his practice through his interest in the history of materials and architecture. Failure and delay through specific forms always inform his choice of sites which be believes the works do not only occupy but are also occupied within the works/objects. Residues and points of chaos registered as marks within the forms he selects, they present us alternative perspectives of looking into the materials/labour conditions of society. Form is important. His work has included objects from jute sacks used to transport commodities to the point of decay and later sewn together with a network of collaborators under specific labour conditions which is then superimposed on architecture. The politics of the hand and it’s parallel relation with architectural forms become a lot more evident. His most recent work, a straight line through the carcass of history has also dealt with forms related to the second world war and bacteria life. His work has been included in the 56 and 57 Venice Biennale, documenta 14 Athens and Kassel, Orderly Disorderly, Accra, Images An Age of Our Own Making, Denmark, the island is what the sea surrounds, valletta 18, Malta and Spectacles Spectations, Kumasi Ghana. He recently completed a year-long residency with the DAAD in Berlin. His current interests are using specific architectural forms with history in the formation of spaces inspired by the potentialities and failures of modernity.